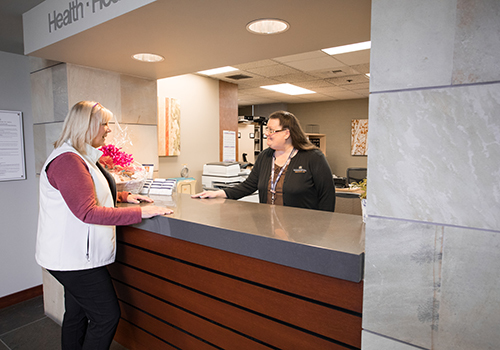 With more than three decades of experience caring for patients in Western Washington, Tacoma Valley Radiation Oncology Centers have become recognized leaders in providing high-quality, personalized care for many types of cancer. We are pleased you and your doctor have chosen us for your care. We know life doesn’t get put on hold for cancer, and we will do our best to make your treatment time with us as comfortable, friendly and efficient as possible. Patients are usually referred to us so that we may determine if their condition can be helped by radiation treatments. If radiation treatments are indicated, our radiation oncologists will plan the best possible way to administer the treatment to be the most effective and to minimize side effects as much as possible. Please explore our site to learn about Tacoma Valley Radiation Oncology Centers, and also to find out more about oncology in general. We have included extensive information about cancer and its treatment as well as frequently asked questions. Because cancer is a life-changing event, we have included links to the latest news in cancer care as well as to support programs and national organizations. We encourage you to read through this information and consider joining a support group. Remember – you’re not in this alone. Never hesitate to ask us questions. Let us know what we can do to make your experience with us the best it can be as we go through this part of your cancer journey with you. 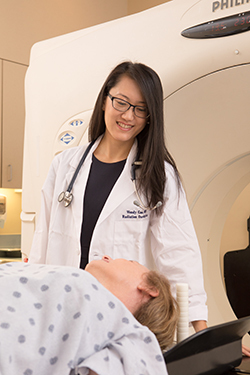 Your first appointment with Tacoma Valley Radiation Oncology Centers will be a consultation visit with one of our board-certified radiation oncologists. This visit will include a health history, a physical exam and a discussion of treatment recommendations and/or options. It may be necessary to schedule other diagnostic tests in order to determine the best course of treatment and/or your physical ability to start treatment. The next scheduled appointment is usually for review and discussion of test results and/or for a simulation. This appointment may take 30 to 90 minutes. A simulation involves using either specialized CAT (CT) scan or other X-ray films to determine the treatment field position. It will be at this time that pen marks and/or tattoos will be placed on the skin so that we can position you precisely for the radiation therapy treatment. The temporary skin markings indicating treatment areas should not be washed away until you are instructed to do so. If you are marked with the permanent tattoos, do not attempt to remove them. These tattoos are a record of the location of the treatment field for your current treatment. This particular treatment field may need to be identified many months or even years in the future. If a CT scan is required either before or sometime during your treatment, it will most likely be performed at our Jackson Hall office where we have a specialized dedicated scanner used only for radiation treatment planning. This procedure may take 10 to 30 minutes. Treatment usually begins between 7 to 10 business days after the simulation appointment. This allows us to complete complex computerized treatment planning. Additional time may be necessary for planning the more technical forms of therapy. The number of treatments prescribed by your radiation oncologist will depend on the size, location, type and radiosensitivity of the disease or tumor as well as your general health condition. The length of time for the treatment varies with each individual and depends on the type of treatment planned by your physician. Generally, the actual treatments take a short amount of time and are painless. The radiation therapists will position you on the treatment machine and will then leave the room during the actual treatment. It will be important for you to lie very still during the treatment. You will be monitored via an audiovisual system for your safety. Treatments are generally given daily, Monday through Friday, at approximately the same time each day. We will attempt to accommodate any requested specific time of day as best we can. Occasionally, there may be an unavoidable delay that will necessitate you waiting beyond your scheduled appointment time, and we apologize should this occur. We assure you, however, that we do make every possible attempt to keep the treatment schedule on time to get you back to your day. For those who may have physical difficulties, there is a wheelchair available for you at each treatment facility. Unfortunately, due to liability issues, our staff members will not be able to assist you into or out of the treatment center office. So please be sure to make arrangements to have someone come with you to help you in and out of your car and into the treatment center. Thank you for your understanding of this policy. Clean the area with a physician-or-nurse-approved cleansing agent. Do not apply soap, creams, ointments or cosmetics to the area unless approved by the doctor. Aloevera gels (99% – 100% pure and colorless) may be applied as often as needed. Avoid applying any substance to the skin 90 minutes before treatment time. Protect the skin from direct sunlight. Do not use hot water bottles, heating pads, sun lamps, ice packs or tape on the treatment area. If the underarm is in the treatment field, do not shave or use deodorant (nonaluminum herbal deodorants may be used). Wear loose-fitting cotton clothing over the treatment area when the skin becomes sensitive. If you are concerned about any reaction you experience during your course of treatment, please bring it to the attention of your nurse or radiation therapist. We want to help you remain as comfortable as possible. Another very common side effect of radiation therapy is fatigue or lethargy. It is important to avoid becoming over-tired. It may be helpful to take rest periods during the day. Again, please talk with us if you need suggestions on managing side effects of treatment. Our staff will closely monitor you during the course of your treatment. You will be seeing your radiation oncologist once a week for an evaluation. It may be helpful to keep a written list of questions for this visit. 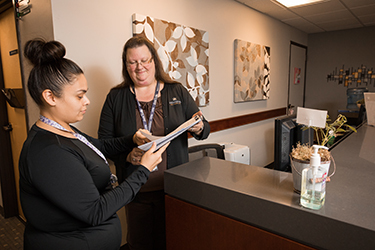 If you have questions or any problems that need immediate attention, please let the nurse know as soon as possible upon your arrival so that we can address your needs without delay. Should you need to have a prescription filled or refilled, please notify the nurse 2 to 3 days ahead of time so that it can be taken care of for you in a timely manner. Be treated compassionately with respect, consideration and dignity. Be cared for by properly trained and professional personnel. Confidential management of your private healthcare records and information. Participate in decisions involving your healthcare, and be informed of any responsibilities you may have in the care process – unless for medical reasons this is not possible. Be informed of the services offered by our practice. Change physicians if you wish. Be informed of our charges and policy concerning billing and payment for services. Be informed of the process for submitting a complaint to both our practice and the State Department of Health. Privacy of your medical records. A copy of our Privacy Practices will be given to you. Follow directions specifically as those instructions relate to treatment preparation and skin markings. Ask questions about any aspect of your treatment procedure or follow-up. Provide accurate information. We expect patients to provide clear and accurate contact information, insurance coverage and health history. Accept financial liability. You are responsible for your bill. Respect and protect others. Due to the compromised immune systems of our patients, sick or recently immunized adults or children should not come to the office. We all share the concern over the rising costs of healthcare. In an effort to keep costs down, we ask our patients to make all co-payments at the time of service; this eliminates the expense associated with mailing out bills for co-payments. We are preferred providers for most regional insurance plans and are participating providers for Medicare. We bill primary and secondary insurers directly. To ensure the procedures associated with your care are covered, please check with your insurer prior to treatment. Tacoma Valley Radiation Oncology Centers accept VISA and MasterCard. In cases of financial hardship, payment arrangements can be made. Please direct your questions to our Patient Accounts Department at 253-779-6323.